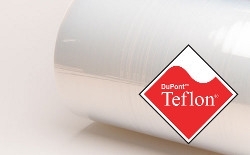 100LP (.001")Teflon® PFA Film x 24"
DuPont Teflon® PFA film can offer continuous service temperatures up to 260°C (500°F). In addition, Teflon® PFA provides superior creep resistance at high temperatures, excellent low-temperature toughness, and exceptional flame resistance. With these superior attributes as well as enhanced flex life Teflon® PFA can be a upgrade where Teflon® FEP will not service the most demanding design hurdles. Quantity discounts available over 1350 SF. Custom slitting services also available. Contact us for details.